I never wanted to lead a boring life, which is why I like to travel so much. But, while I love experiencing new cities and destinations, the process of traveling fills me with untold angst. I am a worrier at the best of times, but add travel, flights and other unpredictable events into the mix, and I become a tangle of fear and loathing. That said, I never pass up the opportunity to experience a new destination, so when Qatar Airways invited me to Sofia last weekend, the bags were packed in record time. The lead time was short, not giving me much time to worry. Sofia and other Eastern European countries had been on my radar for some time. Not that I knew much about it – some wrestlers, a couple of decent 1980s tennis players and undiscovered ski resorts, I also knew the country was a destination for Europeans seeking a value holiday. I also had the sneaking suspicion the country may have had some fairly decent cheese. I wasn’t wrong. Behold Sirene – a white cheese that goes with many things, especially salad vegetables. It is usually served shredded in salads or on its own, but the salad is the most famous incarnation. Made with chopped tomatoes, cucumbers, onions and roast pepper, please don’t tell the Bulgarians the addition of the salty white cheese and bears a striking resemblance to Greek Salad, but is called Shopska Salad in Bulgaria.The Sirene cheese can be goats, cow or sheep milk and comes in blocks not unlike feta. Now the Bulgarians have some awesome traditions, like drinking Raki liquor with their salad appetizers. I may have indulged in this a couple of times over my brief stay. This Shopska Salad is the work of the chef at the Sheraton Sofia Hotel Balkan inside a crispy edible dish of flatbread moulded into a basket. It seems that Bulgarians do love their cheese and I saw this and other feta style cheeses everywhere. 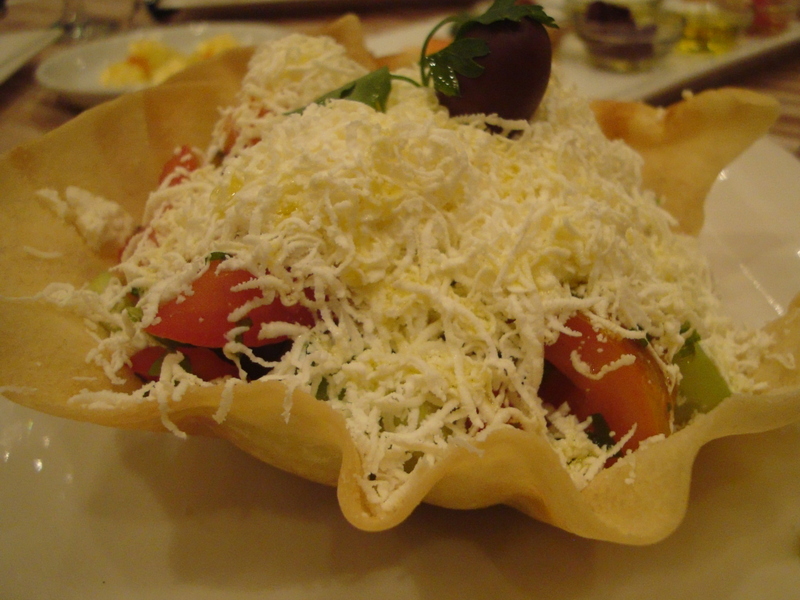 Shopska Salad allegedly derives the regional Shopi people living in Bulgaria and part of Serbia and Macedonia. But a little research revealed that the salad could in fact…be a public relations/marketing creation not unlike the infamous Ploughman’s Lunch. It’s claimed the salad may have been invented by Bulgarian State Tourist Board, Balkantourist in 1960 as a national dish.